Franklin Matters: "new fare would begin June 9"
From the Milford Daily News, articles of interest for Franklin. This is a good idea for Franklin line riders after suffering through shuttle buses for two months due to construction on the weekends. The normal round trip fare for Franklin is $20 so getting multiple rides on the weekend for $10 is a real bargain. 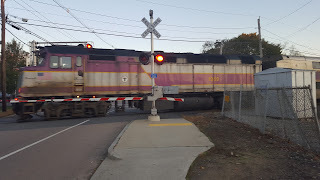 "The commuter rail plans to experiment with new weekend fares this summer, offering customers a $10 ticket to ride as much as they want Saturday and Sunday. “This crisp ten dollar bill would be good for unlimited rides all weekend long,” said Evan Rowe, the T’s revenue chief. The special price will apply to customers over the age of 12 and paying adults can travel with up to two children for free. Typically, a round trip fare costs $15. “It should be leisure rail,” Rowe said."